The goal of any transportation agency is to guard public safety and keep traffic flowing, strengthening America’s transportation infrastructure. One factor that has always been an impending threat is rockfall onto roadways that cut through hilly or mountainous terrain. In severe incidents, roadways can be blocked for days, impacting everyday use as well as vital emergency services and evacuation routes. In fact, transportation agencies are finding that clean up and repair expenses can far exceed mitigation costs. Our work on the East Coast has shown that a proactive approach to rockfall projects has resource-saving benefits. Smart project planning means building in those benefits from the start — minimizing cost while increasing value. As in any project, success depends on staying within budget and time frame. And early action means better results. These three often-overlooked project improvements can streamline and smooth processes, making it easier to meet budget and time constraints. How can you maximize your rockfall project? Getting the most from limited resources starts with making the most efficient use of the concept development phase. DOTs face limited funding, multi-year budget cycles, and phased work. Concept development efforts — when well planned — can produce a resource for years to come, saving re-evaluation costs. For example, as geologists evaluate rock slopes, they define hazard risks, so areas can be ranked from most to least critical. DOT funding can then go to mitigating top priority areas, while lower hazard risk areas are scheduled for monitoring. As funding becomes available, initial site evaluation information and preliminary stabilization recommendations can be used to guide and define new projects. The result? A process that allows DOTs to proactively initiate rockfall mitigation projects on highest priority cut slopes. During a construction project that involved rock slope excavation of the west approach roadway to the Penobscot Narrows bridge, Haley & Aldrich identified several areas that required remediation and ranked them, so that funding could more easily be secured for the current project — and in the future. 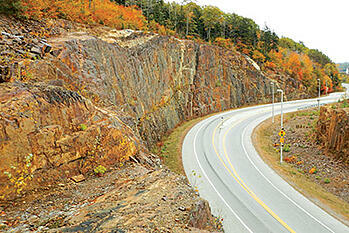 In addition, MaineDOT has instituted a long-term rock slope maintenance and monitoring program. Now MaineDOT geotechnical engineers can compare current site conditions to documented observations, making the yearly re-evaluation process more efficient. Experts can assess areas that require remedial measures and areas that need further inspection, reprioritizing potential hazard areas. These efforts have reduced risk while maximizing funding dollars. Choosing the most appropriate rockfall mitigation approach is difficult because effective hazard remediation is not the only factor to consider. The optimal approach must address an array of concerns from roadway downtime to service lifespan (how long the fix will be effective). A decision matrix tool can be used to compare scenarios and identify merits and drawbacks of each. This structure helps decision makers analyze and compare factors that include technical feasibility, timeline, and cost while weighing additional factors such as aesthetics, access issues, right-of-way, and utility impacts. The matrix allows organizations to investigate and objectively evaluate many alternatives with the goal of selecting a best approach, a preliminary preferred alternative (PPA). At this stage, teams can proactively address concerns that will impact a project such as considerations for community groups or emergency services providers. Identifying issues early helps define an efficient path to final design and construction, staying on schedule and under budget. With this matrix, decision makers can also adapt easily to shifting priorities by weighting criteria differently. If unforeseen problems derail the first approach, the project manager can switch tracks and still stay on schedule, further reducing wasted time and effort. New Jersey presents a unique challenge in rockfall projects because its dense population and varied landscapes demand area-specific considerations. NJDOT’s ongoing work with Haley & Aldrich includes addressing specialized criteria in each decision matrix. • Compliance with permitting for publicly owned lands. • Historic and cultural resources. • Threatened and endangered species. The project team then participates in a workshop to discuss the proposed alternatives and choose a PPA. That’s where consensus-building skills make all the difference. Though the decision matrix helps with evaluating mitigation options, stakeholders are likely to interpret the information in their own way. And, in large infrastructure projects, there are many stakeholders. In addition to a core group of DOT, highway engineers, and other subject matter experts, stakeholders may include local municipalities as well as state and federal agencies such as the Department of Environmental Protection (DEP), Federal Highway Administration (FHWA), or National Park Service (NPS). Community members such as impacted property owners, concerned citizens, and conservation groups also need to become educated about the project’s purpose and invited to provide input. Collaboration is crucial. Fostering these relationships, addressing concerns, and garnering support is essential to agreeing upon a course of action. If a true consensus is reached early in the process, it eliminates time lost to late-stage second-guessing, re-analysis, and re-work. It also helps the project progress from preliminary stages into later stages more quickly. A workshop model streamlines consensus-building. This facilitated meeting pairs technical knowledge with human collaboration to address factors that affect decision making, including experiences, emotions, and attitudes. A subject matter expert guides the conversation while clarifying data and expectations. This emphasis on communication and dialogue also helps gain community support. Facilitators inviting public input should clearly show how the project is taking steps to protect people, scenery, and the environment. It’s important to present solutions in a layperson-friendly way, and proactively address human impacts such as traffic interruptions among high density populations. Innovative methods to address environmental impacts on scenery, animal dens, and migration patterns can be highlighted. See the collaborative process in action: Speeding reviews & reducing project delays for VDOT. Data, facts, and science form the baseline for rockfall projects — but reaching beyond the baseline creates a more efficient rockfall project. Be most effective by making data-based comparisons and responding to stakeholder concerns to build consensus. This will help define a clear path to final design that keeps people and property safe, reduces traffic impacts, and maximizes budget by reducing or eliminating re-work. Is your DOT rockfall mitigation process set in stone? Send me an email and let’s talk about how adapting it can save time and money. 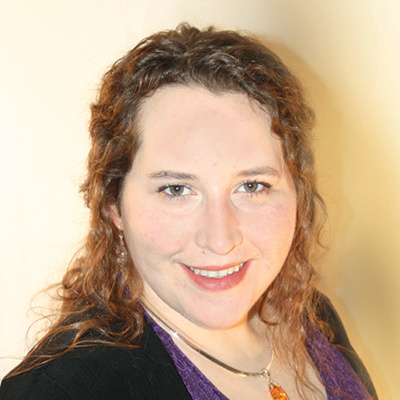 Amber Granger, P.G., is a Senior Technical Specialist in Engineering Geology focused on rock engineering and geotechnical projects, including but not limited to rock slope remediation designs and blasting. She is a licensed Professional Geologist in Pennsylvania, Delaware, New York and Kentucky, and has a Master of Science degree in Geology from Rutgers University and a Master of Engineering degree in Geotechnics from Missouri University of Science and Technology.